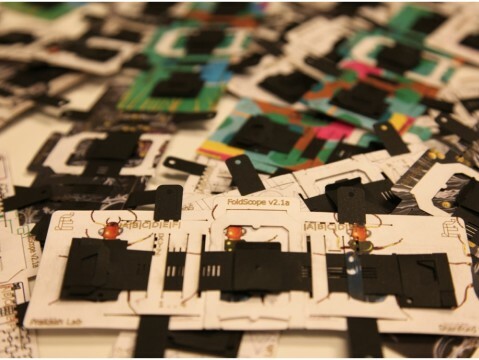 Manu Prakash, a bioengineer at Stanford has designed an origami paper microscope called a Foldscope. He hopes students and life-long learners throughout the world will use them to explore and answer their own questions. To respond to the Do Now, you can comment below or post your response on social media platforms such as Twitter, Instagram, Tumblr, Vine, Flickr, Google +, etc. Just be sure to include #DoNowMicro in your posts. Have you ever wondered what is in a drop of pond or ocean water? What the inside of a worm looks like? What dust is made of? What pollen looks like? What other questions do you have about the microscopic world? Manu Prakash, a bioengineer at Stanford University, has designed an inexpensive, origami microscope to allow people from around the world to explore, make discoveries and answer questions like these. The microscopes are made out of waterproof paper, assembled by the end-user, lightweight, small enough to fit in your pocket and cost less than $1 to produce. Prakash calls them Foldscopes, and they were born out of a desire to make scientific tools accessible to all. 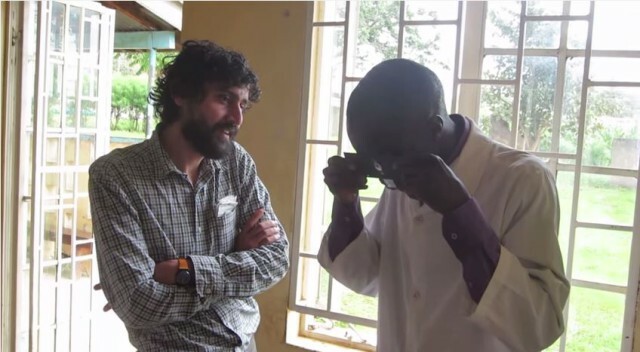 Manu Prakash shows health care workers in developing countries how to use his Foldscope. In designing the Foldscope, Prakash wanted to create an instrument that could be used both by healthcare workers in developing countries and remote areas, as well as by people who might not otherwise get the opportunity to look at the microscopic world. Foldscopes are currently in trials to be approved as diagnostic tools for diseases like malaria and African sleeping sickness. And, through the Ten Thousand Microscope project, Prakash has shipped approximately 50,000 Foldscopes to students and lifelong learners in more than 130 countries who submitted ideas for experiments or questions that they would like to answer using the Foldscopes. Many recipients are already reporting their findings on Prakash’s website. He hopes that this will create a network of learners asking questions, sharing experiments and getting inspired by science. At the basic level, the Foldscope requires no external power or light source; you simply insert a sample slide into the Foldscope, hold it up to a light source and look through the tiny, salt grain-size lens. However, the Foldscope can be modified. For example, Prakash’s team has added external watch batteries, lights, filters and different lenses to make different versions of the Foldscope. You can even attach a smartphone to the microscope in order to record images. He hopes that children, hackers and tinkerers around the world will add to the Foldscope and explore new modes of microscopy. This article provides an overview of how microscopes can be used and includes links to examples of how scientists are using microscopes in their work. Learn how microscopes work by using lenses to bend light to magnify objects. Researchers at University of Houston have created cheap lenses that attach to your smartphone to turn it into a microscope. Here are 50 ideas for things you could look at under a microscope. This article provides tips on making slides and ideas for various objects to view underneath a microscope.